Looking for a gift for a friend who has been down in the dumps? 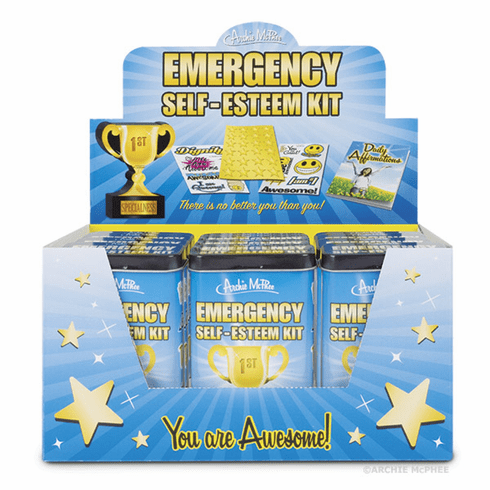 Give them the Emergency Self-Esteem Kit! This kit contains everything you need to rebuild your damaged psyche including a trophy you can give yourself, stickers, a book of affirmations and gold stars. You probably feel better just reading about it. Comes in a 3-3/4" (9.5 cm) tall tin with a mirror on back, so you can look at yourself while repeating the affirmations. Twelve shrink wrapped tins in each illustrated display box.